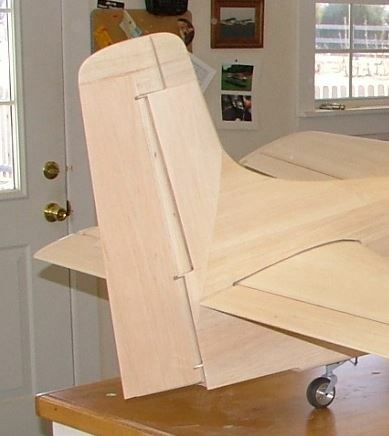 One of the more unique features found on giant scale RC airplanes, and on warbirds in particular, are the inset hinges that use long, thin pivot wires to secure the control surfaces in plane. 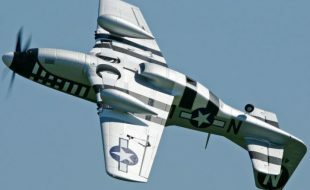 For my current project, an 85 inch span Douglas Skyraider, this type of hinging is used with the rudder, here are some pix and tips from my building board. 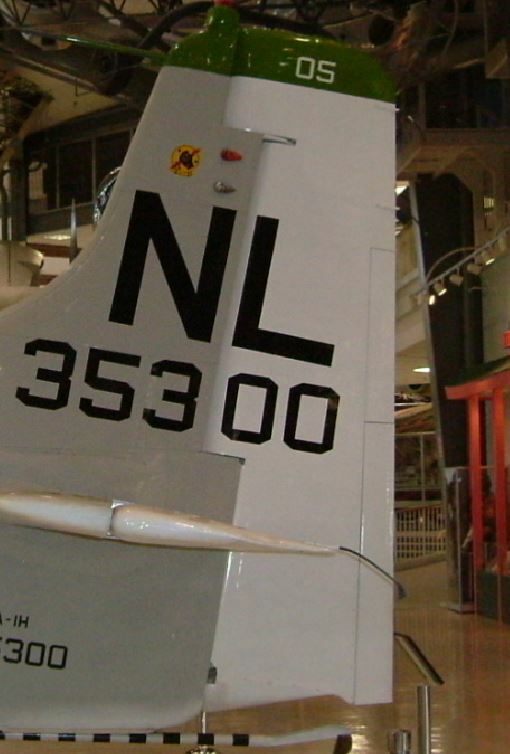 Here you see the full-size rudder from a museum Skyraider. You can see that it has three inset hinge pivot points. 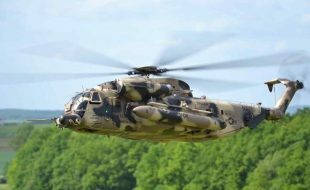 When it comes to building a control surface with inset or recessed hinging, you have to build very accurately and follow the plans precisely. 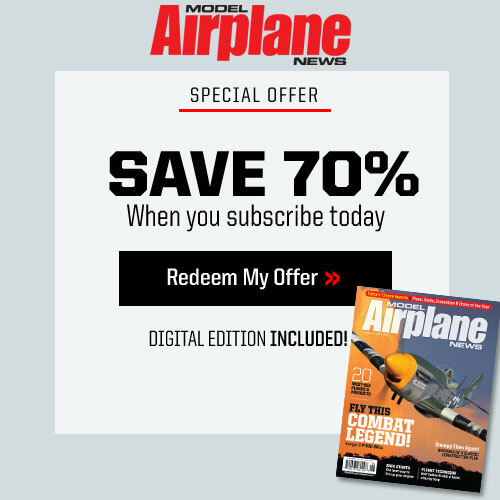 I am building my Skyraider with laser cut parts from LaserCutUSA.com and they match the Nick Ziroli plans precisely. 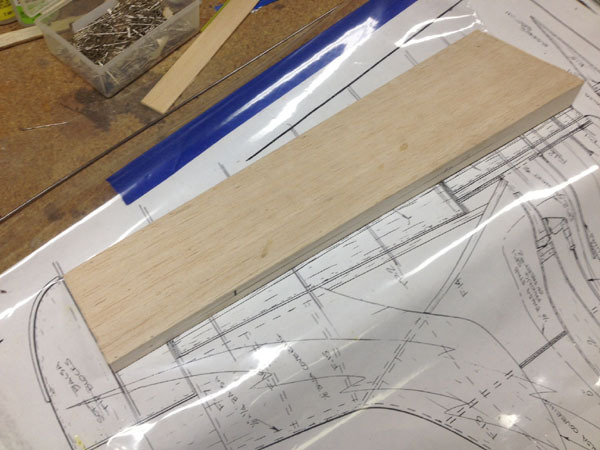 Here are the rudder ribs, the sub-leading edge and the parts I used for the hinging. They are easy to obtain consisting of a length of 1/6-inch welding rod and the yellow inner section of a Gold-N-Rod pushrod from Sullivan Products. These are cut over size to begin with. 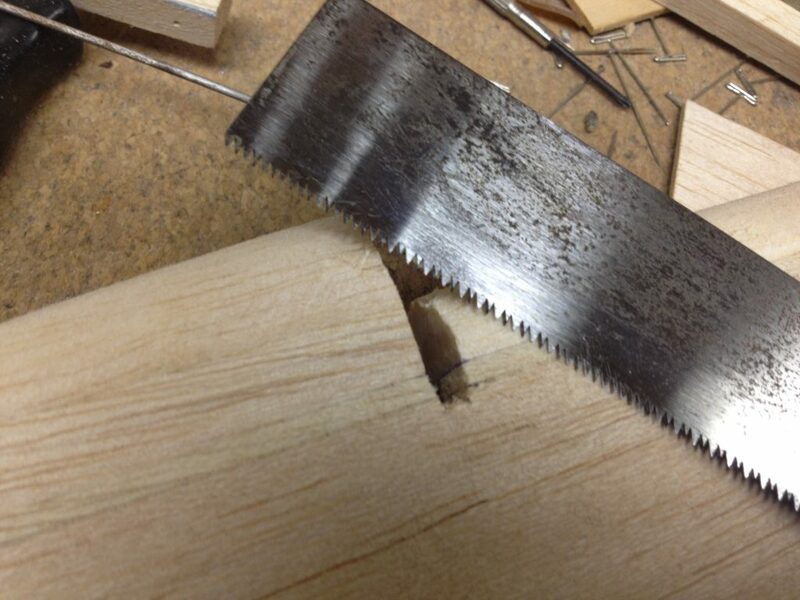 Cut the side sheeting to size and glue the sub-leading edge and the ribs to the right side as shown here. Notice I drew extension guide lines on the plans to help guide the placement of the ribs. 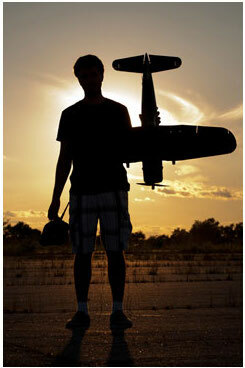 Precision is the key to all properly build RC warbirds. I use ZAP CA glue for most of my building, but when it comes to gluing on sheeting for the rudder, I also use Titebond yellow carpenter’s glue. Here’s a close up of the lower end of the rudder. As you can see, the first hinge support is about an inch from the bottom and the hinge pin wire is secured to the bottom of the hinge. It travels in a straight line all the way to the top support. 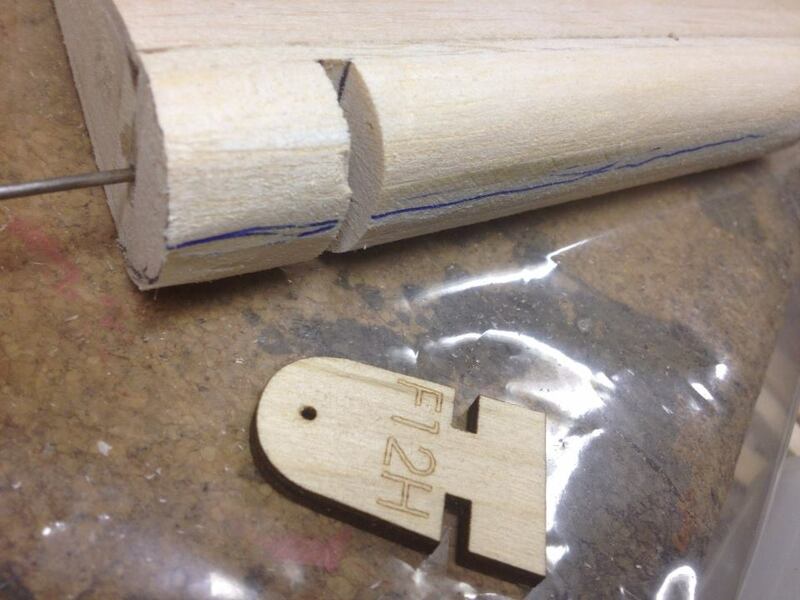 Here’s the completed hinge assembly all glued together and sanded smooth. It fits the plans precisely in width and length. Note that I have drawn a centerline on the sub-leading edge. 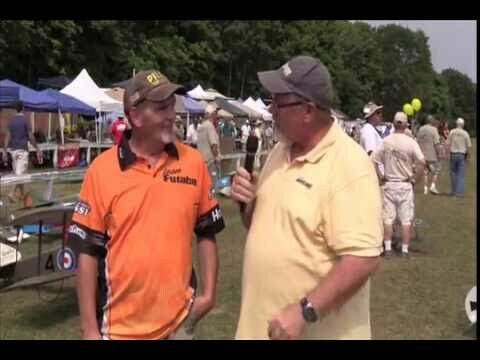 Slide the wire into the yellow Gold-N-Rod and tack glue it over the centerline. Make sure to keep them straight and centered. I drew guide lines on either side of the yellow tube to ensure it is glued in the correct orientation. Next glue 1/8 inch filler strips on either side of the yellow tube and pivot wire, here the left filler piece has been glued in place. 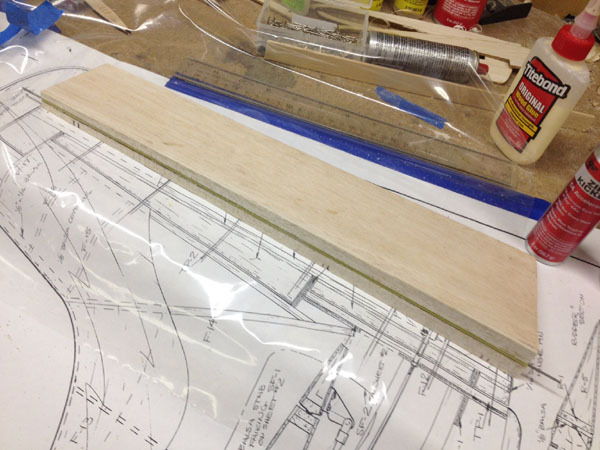 Here both filler strips have been glued in place, trimmed and sanded to shape flush with the outside surfaces of the rudder. 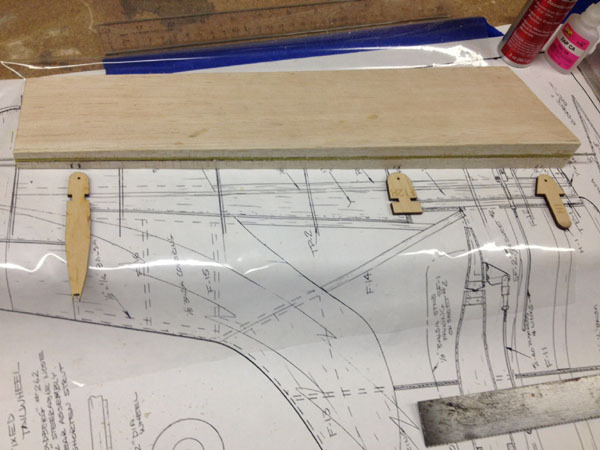 This shows the three 1/8-inch plywood hinge support tabs that will secure the hinge to the fin and the lower rudder post of the fuselage. Mark the locations for the clearance slots that will be formed between the leading edge blocks that will be added next. The slots should be about 3/16 inch wide. 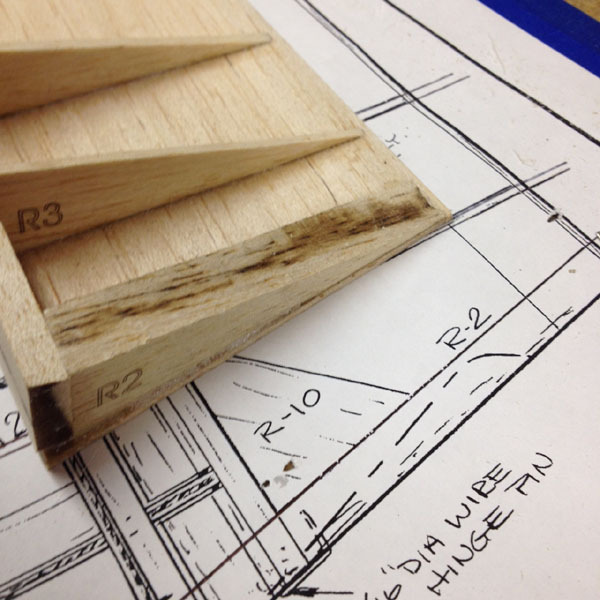 Using the plans as a guide, laminate the wood together to form the blocks. These should be slightly longer and wider than the final pieces so they can be planned and sanded to shape after gluing them in place. 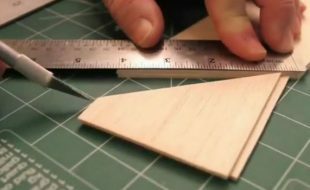 Measure the distance between the hinge slots and sand the blocks ends square, cut to length, (slightly over size), and then sand the opposite end square until you have the exact length needed. 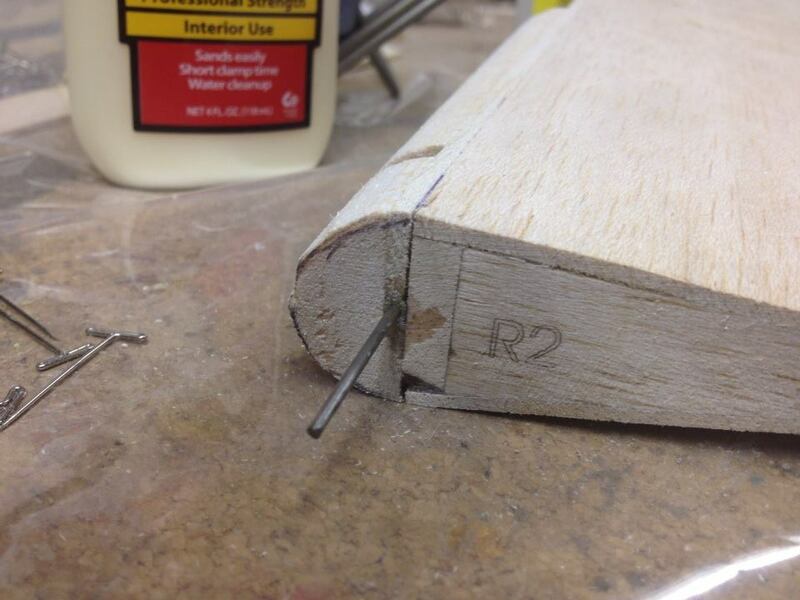 Here you see the bottom end of the rudder with the leading edge blocks glued in place and rough shaped to size. 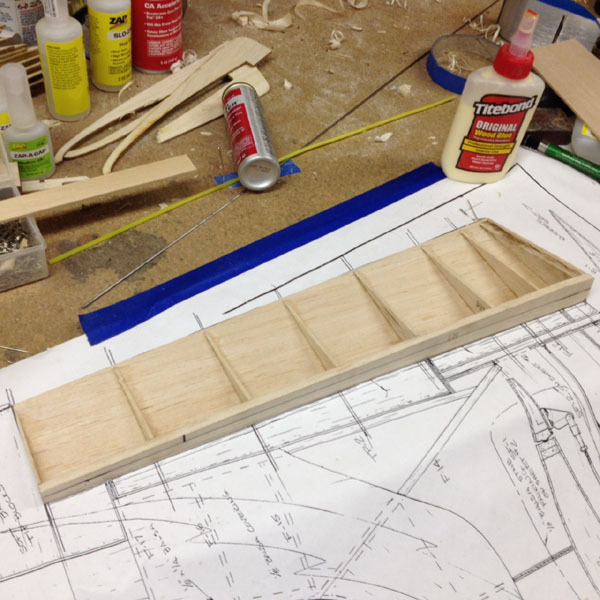 Here is one of the support tabs and the rudder. The space between the leading edge blocks forms the slot (or recess) for the hinge pivot point. 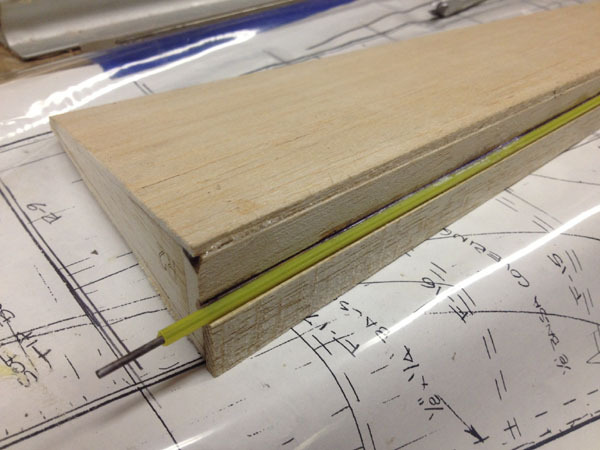 Next simply cut through the yellow guide tube with a Hobby razor saw, (remove the wire pin first), and clean out the pocket to fit the plywood support tab. Cut the slot down through the 1/8 inch filler strips. I use a back-stroke saw from Sears. 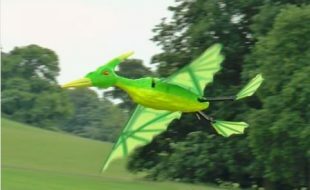 It is very sharp and cuts through balsa and the plastic tube easily. Here you see the pivot wire reinstalled. 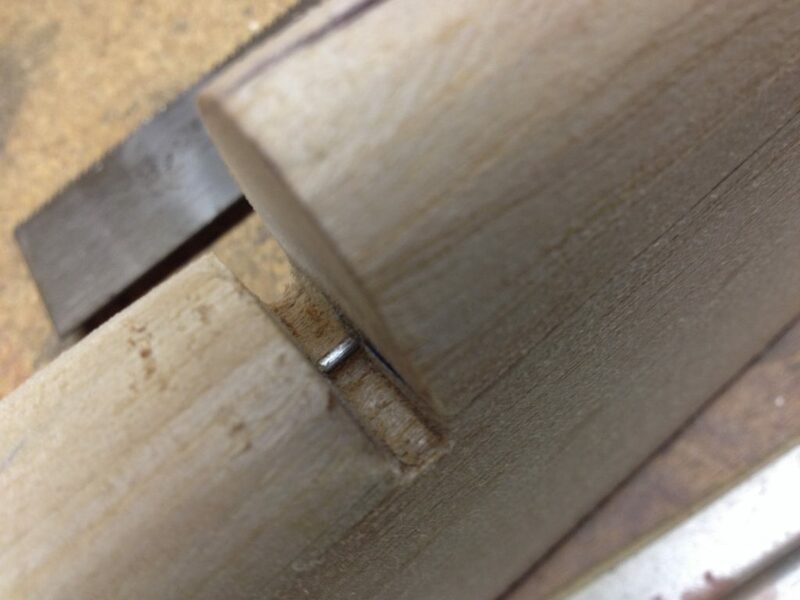 All that’s left is to use your hobby knife to recess the slot near the center to clear the plywood support tab. 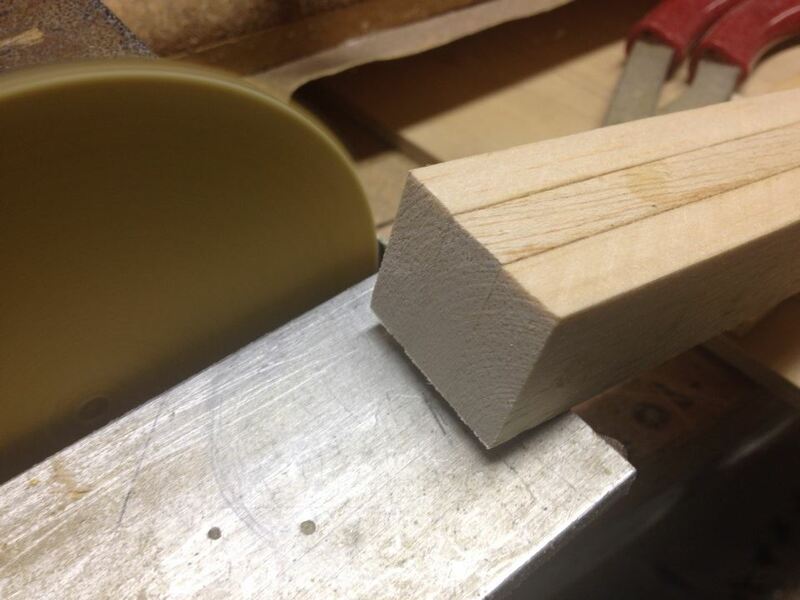 A sharpened length of 3/16 inch brass tubing can be used, and then smooth everything out with some fine sandpaper. 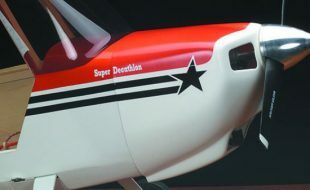 This shows the finished installation of the rudder on the fuselage. 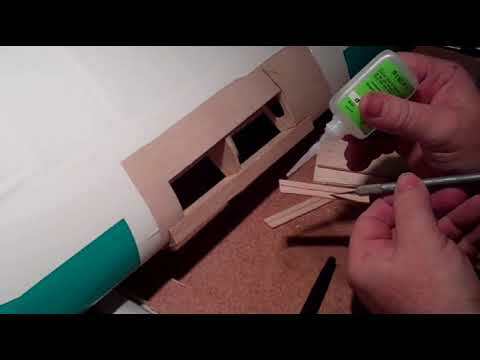 Since my fuselage is not yet built, this example, (courtesy of Gains Smith), shows the setup. 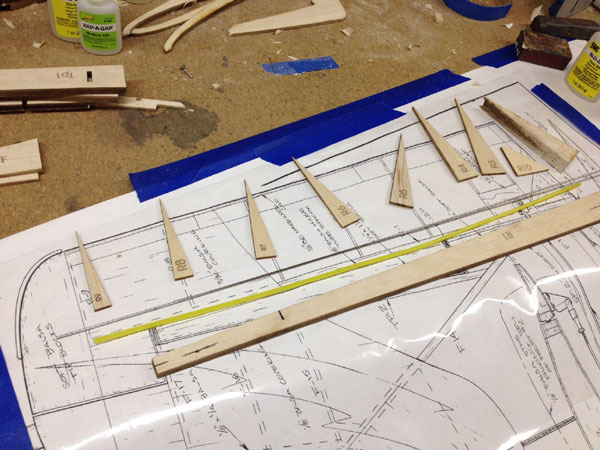 You use the completed rudder assembly and attachment tabs as a guide to glue the tabs in place on the fin and fuselage structure before they are sheeted over with balsa. Stay tuned for more photos to show additional details. 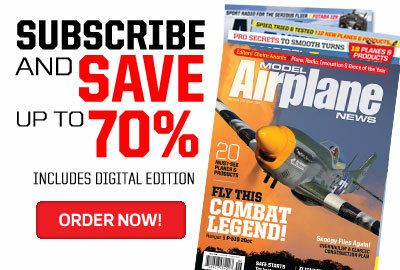 The Skyraider will be the subject of a new Build-Along Series. Sure would be nice to be able to enlarge the photos and drawings in your how-to-articles. So how much bigger do you need them to be? I agree! If you could double the size at minimum (can you create photos that when clicked show in a lightbox with the largest size available?). That’d help out for people who can’t see well enough with those size photos. OK, I see now how the pics can be enlarged, but could they be set up to just use one click on the photo to go to the enlarged version. Now it takes one click on the photo, goes to new screen and then another click on that photo to get the enlargement. 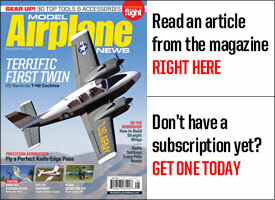 Good how to article by the way. Look forward to the build along. Thanks for the great pictures and detailed description. I’m sad tooto say I still got lost on one step, but that is lack of experience! Andy, where did you get lost? 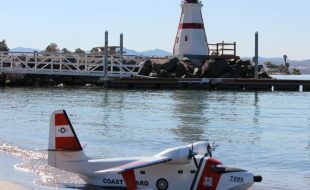 This is an ongoing post… I will be adding more photos soon. I agree you said “Here you see the pivot wire reinstalled.” then you show all the pieces attached. It be nice to see the hinge attached, the control horn etc. I was interested in how you glued the the ribs. 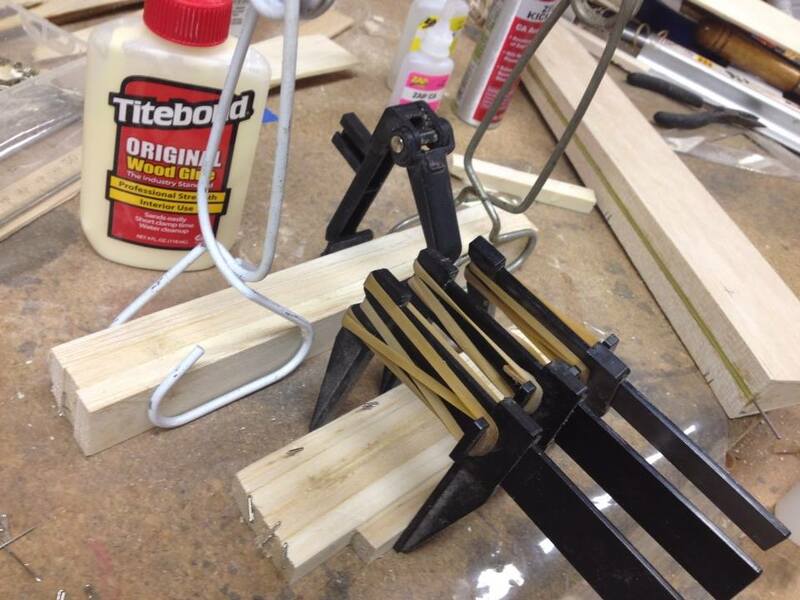 Do you tack them first or used the wood glue. How do you keep it so clean? Tips on gluing would be great addition. I would like to see the photos blown up. To allow you to zoom in. Hi Roger, yes, I will be adding more photos here, this is a work in progress, and I had to stop and complete something else. Anyway, I will be showing more of the pivot wire and plywood support tab details this week. As for the glue, While I was building the rudder, I cut the sheeting first, and pinned in place, then added the sub-leading edge and then the ribs. I use Zap thick CA (yellow bottle) and light mist of kicker spray. 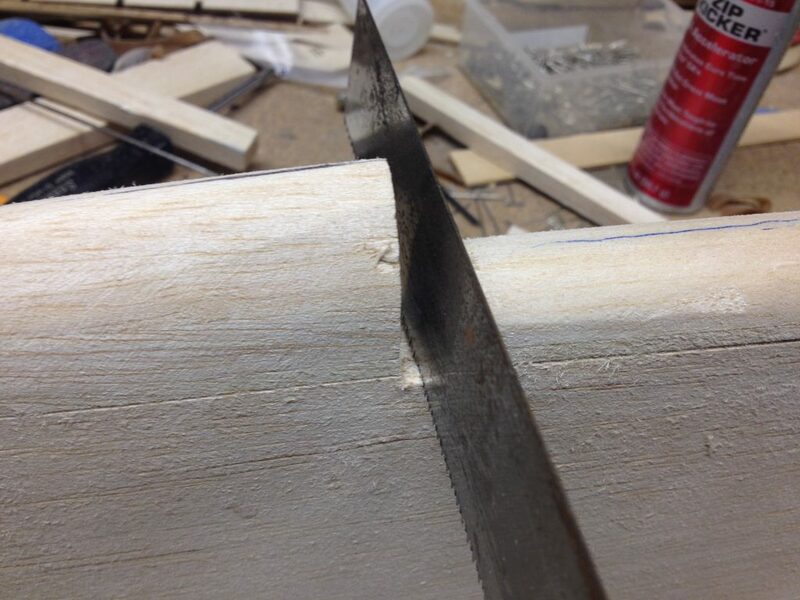 I then sand the top edges smooth, as well as the trailing edge of the sheeting so it blends into the ends of the ribs. I then use yellow TiteBond glue, and apply to the tops of the structure, pin the sheeting in place and let it dry, then unpin, and give it a good sanding to clean up the edges. Basic standard operating procedure. However, it appears that that two photo frames inadvertently found their way in (what is the purpose of the “laminated blocks) photo’s 10 & 11? Great Article, very complete and easy to fllow. I think the Photos in this article are great even for my dodgy sight 😀 double click for even bigger. I copied the How-To & pasted into MS Word. The I adjusted the size of the photos to suit my bleary sight. Just an idea. 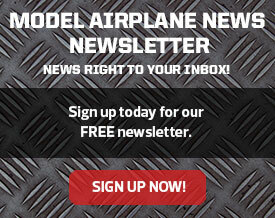 I used the method on my Hostetler Lancair….works great. Very interesting. I’m not into models of this size but would like to give the technique a whirl. Next possible candidate is a Goldberg Tiger 60. I was surprised that ply bearings sufficient, I was expecting brass tube bushings or printed circuit board. Hi David, thanks for your comments. This is the original design by Nick Ziroli, however I am planning to add 1/16-inch ID eyelets to the support tabs just as an upgrade. Nick did say that after 10 years of flying his plywood tabs did wear a little and he then added the eyelets.